This is the type of Kutani ware proficiently which used the vivid five colors of green, yellow, blue, purple and red called Kutani Gosai. 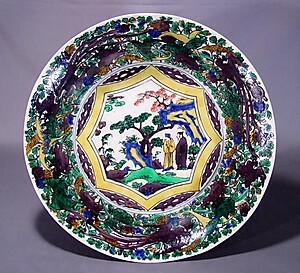 This style is also referred to as “Gosaite”, as the five overglaze enamel colors are used to their full extent. A painterly and realistic approach to drawing a motif in the center is another distinctive feature. The appeal of the style are pictures designed on the ware with the skillful brush work in the overglaze drawing as if taken out of a folding or wall scroll to the porcelain ware.